WASHINGTON (WJLA) - The NFL is reportedly considering requiring its players to stand during the national anthem after weeks of protests from players around the league. The report came Tuesday from ESPN's Adam Schefter. ESPN says it recovered a letter allegedly sent by NFL Commissioner Roger Goodell to NFL teams on Tuesday. "Like many of our fans, we believe that everyone should stand for the National Anthem," Goodell says in the letter. "It is an important moment in our game. We want to honor our flag and our country, and our fans expect that of us. We also care deeply about our players and respect their opinions and concerns about critical social issues. The controversy over the Anthem is a barrier to having honest conversations and making real progress on the underlying issues. We need to move past this controversy, and we want to do that together with our players." The full letter can be read below. 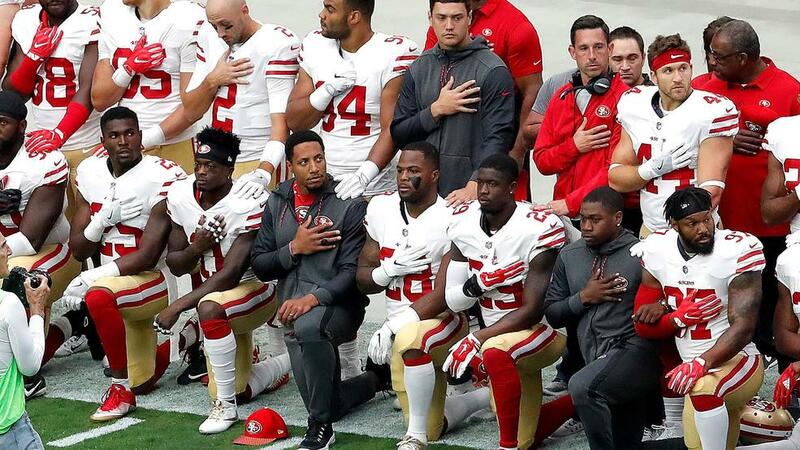 The act of players demonstrating during the anthem started in the 2016 preseason when then San Francisco 49ers quarterback Colin Kaepernick sat during the anthem as a protest of police discrimination against people of color. Kaepernick then began kneeling during the anthem as the season progressed. Other players followed his example, either kneeling, sitting or raising a fist during the song. These actions drew criticism from those who deemed the players' actions unpatriotic or disrespectful. The movement has grown even larger in 2017 after President Donald Trump proposed firing any players who kneeled during the anthem. Some fans have said they will no longer watch NFL games if the protests continue and on Sunday, Vice President Mike Pence left a game between the Indianapolis Colts and 49ers after multiple 49ers players took a knee. Dallas Cowboys owner Jerry Jones made headlines when he said that his players will not play if they disrespect the flag. "There is no room here if it comes between looking non-supportive of our players and of each other or creating the impression that you're disrespecting the flag, we will be non-supportive of each other," Jones said, according to The Associated Press. "We will not disrespect the flag."